President Donald Trump once again rejected “global governance” and rigid multi-nation trade deals before a packed and highly enthusiastic rally in Pensacola, Florida, yesterday. Donald Trump leaves door wide open to a fair climate deal. Photo credit: Shealah Craighead, public domain photo. 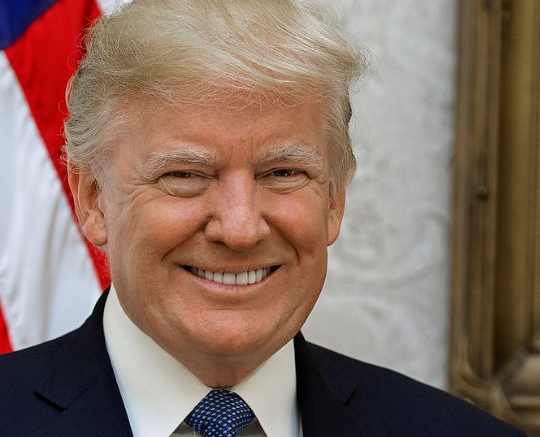 The US President re-emphasized the importance of American national sovereignty and independence from “global bureaucrats” residing in foreign countries. In his speech the President brought up the Paris Climate Accord, a deal he refused to sign early this year, thus setting off outrage among the UN, climate activists, global bureaucrats and Accord cash-beneficiary countries worldwide. He reminded the packed audience that he had promised “to withdraw…from the horrible Paris climate accord” — another promise he has kept. Over the past decade the USA has already substantially cut back its “greenhouse gas” emissions, by an amount that equals Germany’s total annual output – something that never gets mentioned in the media. Paris Climate Accord-promoting Germany on the other hand, has not cut its emissions in almost a decade. Currently the USA emits roughly half as much as China does. Performance by other climate protection-preaching western countries is not always what it is made out to be. Many western countries are meeting their targets by merely offshoring their CO2-emitting industries over to low environmental standards regions like China and India. The result: global CO2 emissions are in reality higher rather than lower. Trump is just far more effective getting the message out at these rallies. He should make major changes when it comes to tweeting, which I think has hurt him more than it has helped. He needs to hold one or 2 of these rallies each month. Probably right although his ability to wind up the usual suspects with his tweets is entertaining (including ‘Special Relationship’ destroyer Theresa May (with an ‘h’ not the p**n star). It’s difficult to argue with his success. Part of the reason he is president and crooked Hillary is not is due to his tweeting. “YES” to R Shearer, that is. Every read a transcript of anything lengthy he said? Your smartphone keyboard’s autocomplete feature produces more coherent sentences than Mr. Trump does. Could you repeat that? It wasn’t very coherent. Poor seb the attention-seeking troll. Trump KNOWS that twitter is mostly occupied by child-minded leftists like you. And you are too dumb to realise it. Hook line and sinker, every time. Funny, but I don’t recall SebH ever criticizing Barack HUSSEIN Obama. Ever notice how Trump’s critics are ever soooo much smarter than he is, …NOT! And then there are the many little chatbot trolls. So very sad. You really are ramping up the mindless nonsense and attention seeking, aren’t you seb. Have you ever tried to read your own rantings? Trump makes WAY more sense than you ever manage. Both rallies and tweets send the MSM into convulsions. Reporters waste lots of time trying to discredit all that he says while he moves on to the next “horrible” thing. While the reporters are off checking an inconsequential ‘fact’ he completes another campaign promise. It is unprecedented that an elected person does what was promised. Yep, that’s the thing with this guy. Nothing he says means anything and he is getting away with it. It’s horrible to watch and I feel for every American citizen who is ashamed of their president and what that office has become under Trump. But, I agree with you. MSM and reporters fall for his traps and it’s hard to watch. Wasting good resources on a pointless effort. Again, nothing he says means anything, so why bother, right? Just let it become normal and watch Idiocracy become reality. Says seb, preening himself in the mirror. Making a promise and keeping it is the essence of saying something and meaning it, you delusional little chatbot!!! Ignoring everything else and focussing on just a few things a person actually did is the essence of being delusional, you little troll. Give specific examples of what we’re missing, why don’t you, SebH? Prove you have something specific in mind, for once. Your sour grapes are very sweet. Trump would not have been my choice, but since his election I have become a fan. Yep, Trump sure is left-field, isn’t he? Difficult to know whether I dislike the man more than his detractors. Don’t think I would want him as a friend and I sure as hell wouldn’t want to do business with him. But President of the USA is a unique postion, and maybe we need a bit of a bxxxxxx in that position. History shows that the best postwar presidents were those who played the game outside of the ordinary political channels (Eisenhower, Kennedy, Reagan, maybe even Nixon?) Obama was a really nice guy – if a bit conceited – but on his watch the profile of his country was seriously devalued. Even if Trump fails (the whole establishment is out to get him, and they may well succeed) I’ll console myself with the memory of how he pushed back – a little at least – against the PC tyranny that has led us so seriously astray in recent years. I am surprised at the ongoing criticism of Trump because compared to other presidents he is actually fairly mild in his actions . He has not engaged in battle with the unions , as Reagan did with the air traffic controllers . He has not invaded another country for reasons of regime change as Kennedy tried (Bay of Pigs ), Reagan (Grenada) and Bush Jr ( Iraq). He has not used his presidential authority to commit a serious sexual assault on a vulnerable young woman (Clinton). He has not sent to unaccountable destinations 1 billion USD from US taxpayers without any Congressional approval (Obama). The main source of the constant vilification is from 3 losers in the race to the White House, McCain, Gore and Clinton. They attack Trump not for what he is or does ( because he does not actually do much) but because he is a constant symbol of their failure and that is something they can never banish from their minds . Good to see he dissed renewables. I sincerely hope wind stocks took a hit shortly after that. Because they are bird-shredding, bat-bursting, unreliable, subsidised eyesores, that do nothing to reduce CO2 emissions. And the latter is a non-problem. Thanks for enlightening us with your fantasies. So exactly what was fantasy, Sebastian? Sadly, I doubt that will happen – digging up and removing the huge concrete bases is very unlikely. And what about the access roads – will they be put back to original moorland? Yes, Dave. Sadly true. Those things will remain a testament to human stupidity for millennia to come. Meanwhile, Scotland’s hopelessly forecasted 10,000 ‘turbines’ by 2020 continue to generate big cash for estated owners – a tidy sum (in one instance alone via Braes O’ Doune), of near £3k per day – guaranteed for twenty-five years. For what, exactly? A highly intermittent output return of at best a third of rated capacity, in order apparently to reduce national CO2 emissions representing 0.015% globally. “sod” has a long history of trolling over at Pierre Gosselin’s place, so you are wasting your time trying to reason with him. SebastianH, Do you have your next assignment? Must be tough when you are abruptly re-assigned as ‘sod’ was.